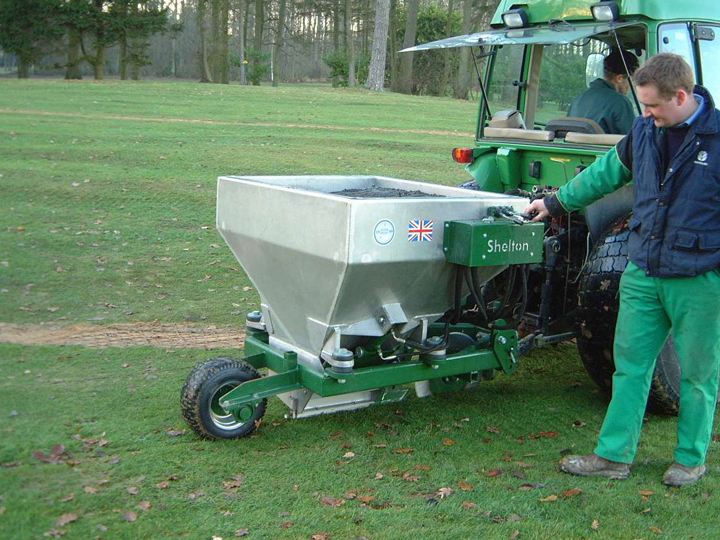 Our award winning Supertrencher+ trenchers are ideal for installing land drainage pipes and other underground services such as cables on sports fields and any other turf areas, especially where minimum surface damage is demanded. There are 4 trenchers in the Supertrencher range; the 450, 560, 625 and the 760. The Supertrencher+760 is our largest, it will accurately dig trenches up to 760mm in depth and up to 155mm wide. All of our trenching range can be fitted with laser guiding capability. The Supertrencher+’s digging wheel, in line with the centre of the tractor, excavates soil from the trench and this excavated soil is thrown into a large aperture at the front of the machine, and then elevated via two conveyors into a trailer or dumper running alongside. You are left with a clean trench which is ready for laying piping or any other service required. The Supertrencher+’s conveyor mounting point is hinged so that it can be turned through 90° to lay alongside the body of the machine for transport. Moving the conveyor to the transport position opens up a massive inspection port should the need arise to look inside the housing. Conveyor height and depth of trench are adjusted hydraulically. The Supertrencher+ trenchers are 3-point linkage, tractor mounted and PTO driven. The conveyors are driven hydraulically as is the discharge height of the main conveyor. Twin hydraulic cylinders control the digging depth and the machine can be easily fitted with laser controls for accurate grading of trench lines. They have two gearboxes enabling the digging wheel to be driven at speed for dry hard conditions, or more slowly for work in wetter soils. At the rear of the trencher is an inspection port allowing easy access to the cutters enabling them to be changed by the operator in the standing position. Cutters are attached to the wheel with one nut and bolt reducing downtime.